Thankfully the sunshine has decided to linger around a little extra for me today. Clouds are definitely brewing, but they are happy, fluffy white puffballs for right now. I actually kind of feel like a Bob Ross painting sitting on my deck right now. With the springtime blossoming all around, I have been in a mood for light-hearted reading. 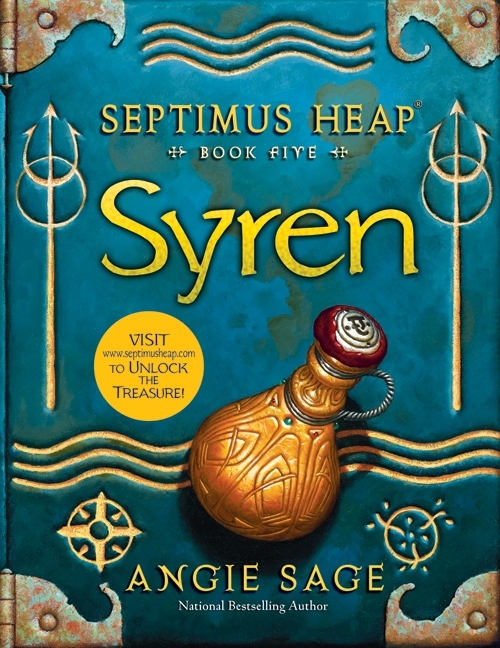 I continue with the "Septimus Heap" series today. Another good showing from Angie Sage. The whole series has been enthusiastically fun while being about some pretty serious business. I guess I just appreciate the style of making our mundane, modern things Magyckal with twisted spellings and exaggerated capitalization. Not to mention the actual magic being activities we have been doing as household chores all these years. (Seems legit that a medieval serf time-traveler would find a Toaster magical.) The series has given me a boost of imagination and flair. I really look forward to the next novel--and maybe even the next series, "TodHunter Moon". The characters pick up right after the close of Queste. While everyone in the previous couple of books have been scattering about on their individual journeys, we see a complete collision course of destiny in Syren. The villains are up to no good as usual, but there is nothing exceptionally dark about these books. They don't take themselves seriously, yet they have some really good things to say about family, friendship, loyalty, and all those other good morals you want your kids to learn. I really enjoy the lessons imparted from Septimus' and Wolf Boy's time spent in the Young Army. If you are ever flying off to deserted islands on your dragon, remember your Hostile Territory pack.